This legal template is a comprehensive agreement for use between a manufacturer and a corporation or individual who is appointed as exclusive sales representative for the sale of a Manufacturer’s products in a defined territory. This agreement is designed for use in any state of the USA and it can also be used in an international context. You need this document if you are a manufacturer looking to appoint a sales representative to sell your products, and want to formalize the relationship between you and protect your interests. 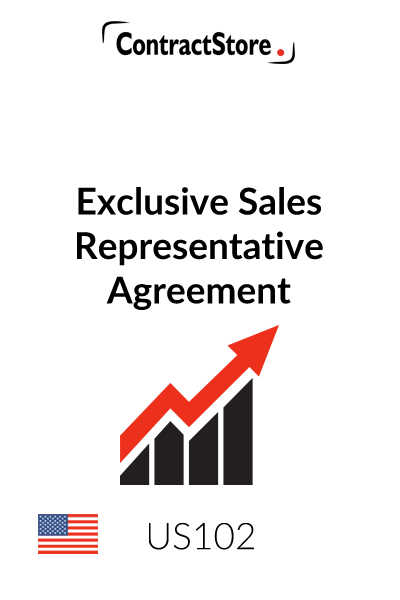 This Exclusive Sales Representative Agreement is designed for use between a product manufacturer (“Manufacturer”) and an independent sales representative (“Representative”). It can be signed either by an individual sales representative or by a corporation or other entity. If one of the objectives of Manufacturer is to avoid an employer-employee relationship with a sales representative who is an individual, it can be beneficial from a planning perspective for the sales representative to set up an intermediary corporation or limited liability company which then enters into this Agreement as Representative. 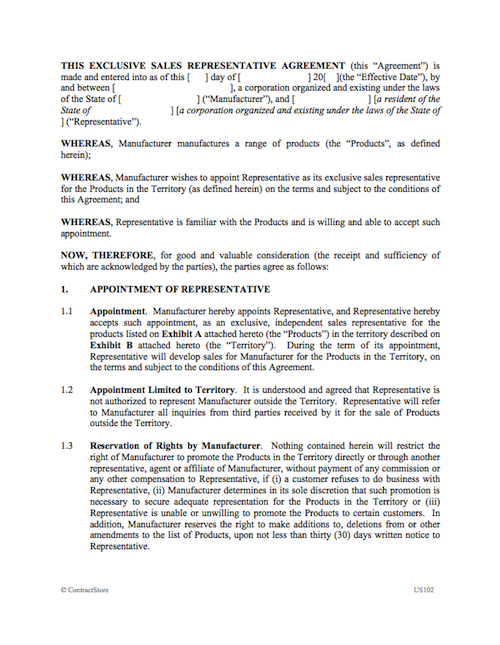 Under this form, Manufacturer retains Representative on an exclusive basis to promote and solicit orders for certain named products (listed on Exhibit A) in a defined territory (delineated on Exhibit B). The sales representative is authorized to solicit orders for products in a designated territory and derives its compensation from a commission based on actual sales. The sales representative does not buy the products for its own account. The sales representative usually does not bear any credit risks associated with the sales. The sales representative maintains no inventory or warehousing. A sales representative usually has no authority to bind the manufacturer (this being the chief distinction from a commercial agent). A sales representative may be retained either on an exclusive or on a non-exclusive basis. This form is intended for use in any state in the United States. However, as is the case with any agreement for use in the United States, regard must be had for the possibility of variations in the laws from state to state (which are commented on below where material). In the context of commercial relationships, the laws do tend to be substantially similar among the states, but there are areas of substantive difference. In this regard, the state of Louisiana stands out in particular, as it bases parts of its commercial and other laws on the civil codes rather than on the common law. In the specific context of sales representative agreements, most U.S. states have statutes that are protective of local sales representatives. The major features of statutes of this type are described below. When in doubt, it is imperative to consult with competent legal counsel admitted in the state in question, as liabilities for Manufacturer under such statutes can be considerable (though this ends up being mostly a due diligence exercise as such liabilities cannot usually be excluded by contract). This form can be used in the international context, and provisions that are intended to accommodate such use are identified below. A number of foreign countries also have legislation protective of sales representatives or commercial agents (member states of the European Community, Costa Rica and most countries in the Middle East, to name a few). These statutes may restrict the ability of Manufacturer to make changes to the Product line or Territory, or otherwise to terminate (or decline to renew) the Agreement. As a result, it is imperative to consult with competent legal counsel admitted in the country in question as liabilities for Manufacturer under such statutes can be considerable (though this ends up being mostly a due diligence exercise as such liabilities cannot usually be excluded by contract). This form provides a good starting point for preparing a first draft of an Exclusive Sales Representative Agreement. However, as with use of any form, it is very important to take the time to read the form in its entirety to ensure that it is customised appropriately for use in your individual situation. For all but the simplest of transactions, it can be anticipated that some customisation will be in order; and as mentioned above, it may also be advisable to consult with competent legal counsel. They require sales representative agreements to be in writing. They stipulate a number of days (ranging from 0 to 45) from termination of the agreement within which commissions must be paid. They provide additional damages for failure to enter into a written agreement and for failure to pay commissions when due. They provide for recovery of attorneys’ fees in respect of a successful claim under the statute by a sales representative. They prohibit the parties from waiving the provisions of the statute by contract (e.g., either expressly or by providing in a choice of law clause for application of the laws of another state). A couple of jurisdictions, notably Minnesota and Puerto Rico, go further and actually prohibit a manufacturer from terminating or declining to renew a sales representative agreement unless there is good cause to do so. In other words, even if an agreement is set up to expire in a fixed period of time, the manufacturer cannot terminate or declining to renew it unless there is an unremedied breach of contract by the sales representative or unless there is other good cause for doing so. Paragraph 1.1 contains the basic terms of the exclusive appointment. The Products and the Territory should be defined on Exhibits A and B respectively. Note that although the basic appointment is on an exclusive basis, paragraphs 1.2 and 1.3 contain some customary limits on the promotion rights of Representative, and these should be reviewed for consistency with the terms agreed upon by the parties. Some of the protective statutes described above may preclude changes to the Product list as anticipated in paragraph 1.3. Paragraph 2.1 defines the obligations of Representative in fairly standard terms. Among other provisions, paragraph 2.1.12 anticipates that Representative will agree to a minimum order volume which will be set forth on Exhibit C. Under paragraph 2.1.12, failure to meet the minimum requirement means that Manufacturer can opt to terminate Representative’s exclusive rights or even terminate the Agreement; and in this regard, the brackets and bracketed language that is redundant should be deleted. Paragraph 2.2 requires Manufacturer to provide certain support to Representative in the form of sales and product literature. This provision also deals with translations of such literature (which, though more common in the international context, may also be important within the United States in regions with large non-English-speaking ethnic populations). Paragraphs 3.1 through 3.5 deal with the basic terms and conditions of solicitations of sales by Representative. Paragraph 3.1 requires Representative to adhere to the terms and conditions and pricing established by Manufacturer. Paragraph 3.2 reserves certain rights to Manufacturer (including the right to reject orders from customers). Paragraph 3.3 requires Representative to notify customers of certain items. Paragraph 3.4 prohibits Representative from accepting returns of Products without Manufacturer’s consent. Paragraphs 4.1 through 4.3 govern Representative’s compensation. Representative is entitled to a percentage (to be specified in paragraph 4.2) of the Net Sales Price (as defined in paragraph 4.1) of Product orders. Under paragraph 4.2, the payment of the commission is to be made within 30 days after either the acceptance of an order or receipt of payment by Manufacturer (and in this regard, the brackets and bracketed language that is redundant should be deleted). Note that the latter choice in effect requires Representative to take on the risk of nonpayment (which is normally a risk of the Manufacturer). Paragraph 4.3 is optional and deals with reimbursement of Representative’s expenses. It should be deleted if not applicable. Paragraph 5 confers upon Representative relatively broad rights to use certain trademarks and other related intellectual property of Manufacturer in connection with performance of Representative’s obligations under the Agreement. 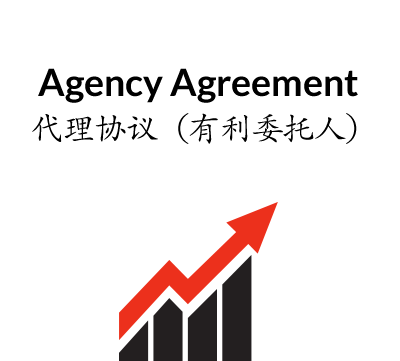 Paragraph 6 contains alternate language with respect to the appointment by Representative of agents to promote Products. The first option allows Representative to appoint agents, subject to certain specific limitations. The second option requires the prior consent of Manufacturer, and then (in the bracketed language) either limits or does not limit the discretion of Manufacturer in this regard. The brackets and bracketed language that is redundant should be deleted. Paragraph 7 requires Representative to keep records of its customer contacts and to make certain periodic reports to Manufacturer. This is a short form confidentiality provision which may be adequate in many cases. If more detailed or more extensive protection is required, consider using a free-standing Nondisclosure Agreement available elsewhere on the ContractStore website (or incorporating the confidentiality provisions from that Nondisclosure Agreement). Note that this provision is expressed to survive termination of the Agreement, and does not expire by its own terms. This is a short form noncompete provision which may be adequate in many cases. If more detailed or more extensive protection is required, consider using a free-standing Noncompete Agreement available elsewhere on the ContractStore website (or incorporating the noncompete provisions from that Noncompete Agreement). Note that this provision is expressed to survive termination of the Agreement for the noncompete period (12 months). It is deliberately limited in geographic scope and duration to reduce the risk of challenge on grounds of being “unreasonable”; any increase in geographic scope and/or duration should be the subject of consultation with competent legal counsel admitted in the state or country in question. Additional liabilities may attach to the parties’ relationship if it is deemed to be an agency, partnership, joint venture, employment or other similar relationship. Paragraphs 10.1 and 10.2 are intended to make clear that the parties are independent contractors and have no authority vis-à-vis one another other than is expressly provided in the Agreement. Paragraphs 10.3 and 10.4 are intended to clarify that Representative is liable for obligations relating to its employees. Paragraph 10.5 is relevant only if this Agreement applies in an international context, by requiring Representative from refraining from conducting its activities in a way that would result in Manufacturer having a taxable presence in Representative’s country; if not relevant it should be deleted. This is “boilerplate” language. Under U.S. law, a person can have considerable exposure for the activities of other persons, and therefore it is common to seek protection from this by way of contract clauses such as this one. The bracketed language in paragraph 11.2 applies only in the international context, and if not relevant should be deleted. Insurance can be dealt with in more detail than is provided here, depending on the nature of the parties’ relationship. It is possible for insurance clauses to be several pages long. This language is intended to leave specific decisions as to insurance coverage up to each party, based on notions of what is commercially reasonable. Indemnification provisions are customary in contracts particularly where significant liabilities are possible. This is a standard form provision that purports to make Representative responsible for any damages caused to Manufacturer as a result of negligence or other misconduct, breach of contract, or claims from certain third parties. Note that this provision is expressed to survive termination of the Agreement, and does not expire by its own terms. This Agreement is set up to be in force for a fixed term to be specified in paragraph 14.1. Upon the expiration of this term, the Agreement terminates. Other options are possible here (e.g., automatic renewals unless either party serves notice of non-renewal, rolling renewal terms, etc.). In the sales representative context, the automatic termination is preferable as goes the furthest in preserving basic “at-will” termination rights upon expiration of the term, though it does force the parties affirmatively to renew or renegotiate its terms at that time. Note that any provision that allows a manufacturer to terminate or decline to renew a sales representative agreement may be void under local protective statutes in a handful of U.S. states and a number of foreign countries. Paragraph 14.2 describes some limited circumstances in which one party or the other can terminate the Agreement prior to its term. Note that paragraph 14.2.2 allows termination on an at-will basis upon six months notice, which should be reviewed carefully in case it would not be in the interests of one party or the other to allow such an abrupt termination. (This type of provision may also be void under local protective statutes in a handful of U.S. states and a number of foreign countries.) Paragraph 14.2.2.2 also allows termination for material breach by the other party – which expressly includes any failure by Representative to satisfy its minimum order requirements under the Agreement. Paragraph 14.3 contains a description of the major consequences of termination of the Agreement, including a provision for payment of accrued commissions. As noted above, local law may require payout of commissions sooner than the 15 days called for in paragraph 14.3. Paragraph 14.4 provides that certain terms may survive termination of the Agreement. Paragraph 14.5 contains a provision to the effect that Representative waives any right to payment under applicable protective statutes. Although it is customary to put a term to this effect in sales representative contracts, it is unlikely to be given effect in jurisdictions with strong protective statutes. Choice of law can be contentious in U.S. contract negotiations because there are 50 states to choose from, and each party may have an instinctive bias in favour of using its own state law. Unless there is some reason to pick another state’s law (e.g., more favourable substantive law), it is customary to pick the laws of the state with which the drafting party is most familiar (again, usually its own state). This choice of law provision picks the laws of a single state (federal laws apply regardless of the state law election), which is most likely to be respected by the courts if it has some relationship to the contract (subject to application of mandatory principles of local public policy). However, it is important to note that this choice of law clause may be void under local law to the extent that it attempts to exclude local sales representative protection statutes in many U.S. states and a number of foreign countries. In U.S. contracts for the international sale of goods, the specific exclusion of the U.N. Convention on Contracts for the International Sale of Goods (the CISG) is common and reflects a typical bias in favour of applying U.S. sales laws over the laws imposed by an international treaty (the interpretation of which is often unclear). Although this is not strictly a contract for the sale of goods, it is good practice to exclude the CISG if one were predisposed to doing so anyway. Note that unless it is specifically excluded, the CISG will apply to any sales contract where both parties are from countries that are signatories to the CISG. If this Agreement is being used in a purely domestic setting, then the bracketed language relating to the CISG can be deleted. The dispute resolution provision offers alternative language for arbitration and litigation. Arbitration tends to be favored in international contracts because the United States is a party to the Convention on the Recognition and Enforcement of Arbitral Awards. Even where arbitration is elected, it is helpful to include an exception for attempts to seek injunctive relief. The clauses do leave blank a number of matters, including the place of arbitration and the choice of state for litigation-based dispute resolution. The choice of rules is also bracketed in case the parties elect to use a different set of rules (e.g., the International Chamber of Commerce). In U.S. litigation, the prevailing rule is that each party bears its own litigation costs (subject to some narrow statutory and other exceptions). The language in paragraph 15.3 is intended to impose the so-called “English rule” to litigation costs. The force majeure periods in paragraph 16.1 should be adjusted in light of the nature of the Agreement and the term of the Agreement as a whole. Notice information should be completed in paragraph 16.2. Notice by e-mail could also be added as an option if the parties are comfortable with this method of notice. The non-assignment provision in paragraph 16.5 contains a couple of options between which the parties should choose. The brackets and bracketed language that is redundant should be deleted. Paragraph 16.7 should not be deleted. Most states have moved away from an “all-or-nothing” approach to enforcing illegal or unenforceable contract provisions, and the severability provision in paragraph 16.7 is an attempt to instruct a court to take a flexible approach to the Agreement in the event that one or more clauses prove to be illegal or otherwise enforceable, provided that it is still possible for the essential intent of the parties to be achieved.